IBlogger 2.0.2 runs on iOS 4.1 and higher, and runs great on the Verizon iPhone. 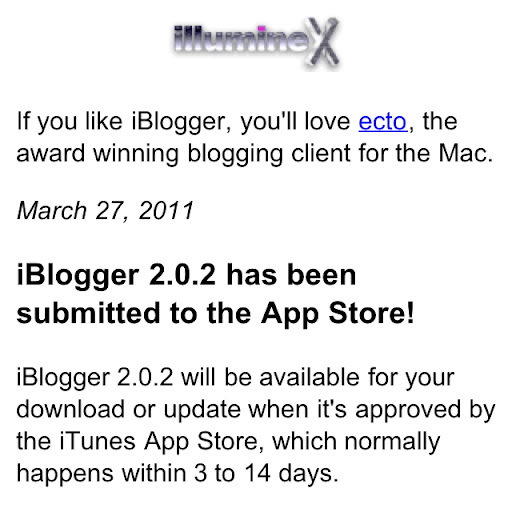 iBlogger 2.0.2 has been submitted to the App Store. it will be available for update or download once approved, which normally happens within 3 to 14 days. Performance and stability enhancements so it can run on older systems including iOS 4.1 and higher (the initial release of iBlogger 2.0.1 was limited to iOS 4.3 and higher). Now runs on Verizon iPhone.